JCU’s ground breaking education and student services building has received another award. James Cook University’s ground breaking education and student services building has received another award. Last month, Education Central won the Australian New Construction Major Facility category in the Council of Educational Facility Planners International (CEFPI) Australasia awards in Adelaide. On Friday night, Education Central, designed by Wilson Architects with Architects North, was again acknowledged at the Australian Institute of Architects (AIA) National Architecture Awards. The building won the Walter & Oliver Tunbridge Award for Building of the Year in the Public Architecture category. Professor Nola Alloway, Dean of the College of Arts, Society and Education at JCU, said the award was a further reflection of the outstanding collaborative effort between the architect and the staff in the School of Education. “During initial planning of the facility the design team and JCU teaching staff engaged in extensive consultation and collaboration to determine a campus upgrade that would improve student services and support contemporary methods of teaching and learning,” Professor Alloway said. “The School staff worked with the architect to create innovative spaces with a view to optimising student engagement, motivation and learning outcomes. 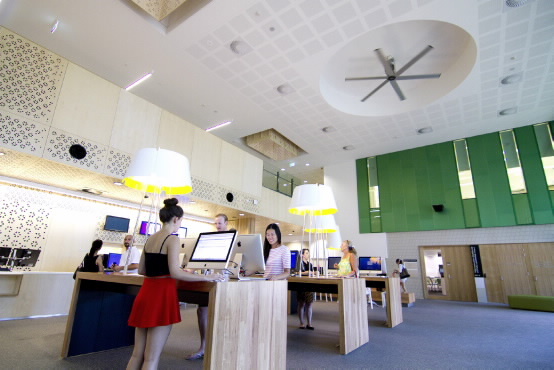 JCU Education Central has improved student services and incorporates contemporary methods of learning and teaching. The facility includes large-scale active learning spaces that support technology-enabled active learning (TEAL) areas that are spacious, well-appointed and flexible. Education Central and Wilson Architects will now compete in the national AIA awards, which will be held in November.